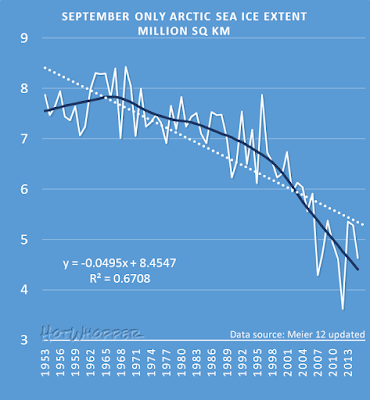 The other day I wrote about Arctic sea ice and showed a chart from Meier et al (2012). The chart went from 1953 to 2011. 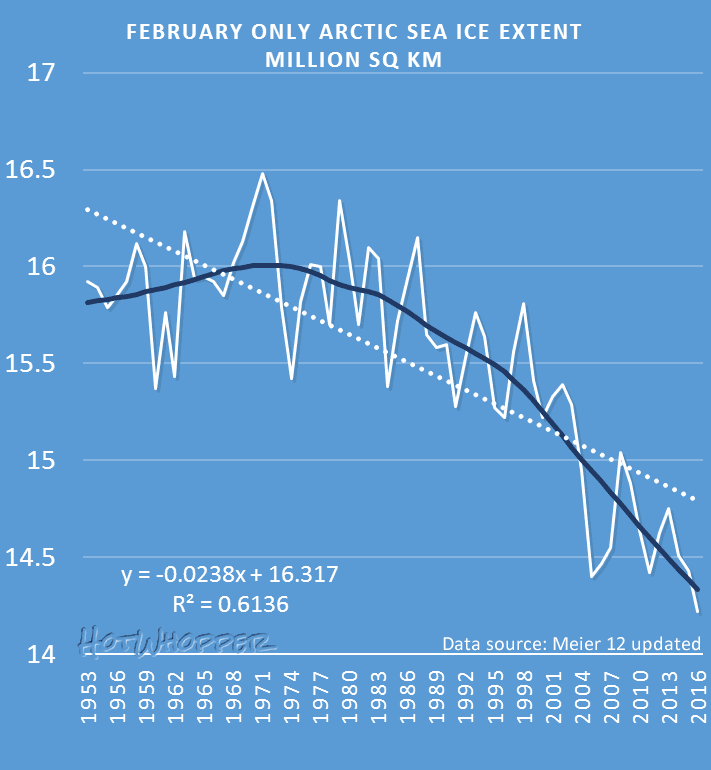 In case you can use these somewhere while you're talking Arctic sea ice, I've now got updated data and have plotted charts from 1953 to the present. I can do others if you want (just ask in the comments). I'll be a bit busy over the next few days, so won't be able to respond immediately - should be within a few hours tops. 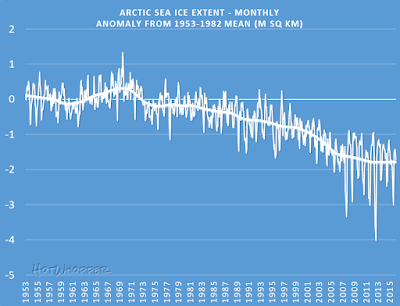 As requested, a chart of the monthly sea ice extent as an anomaly from the 1953 to 1982 mean. 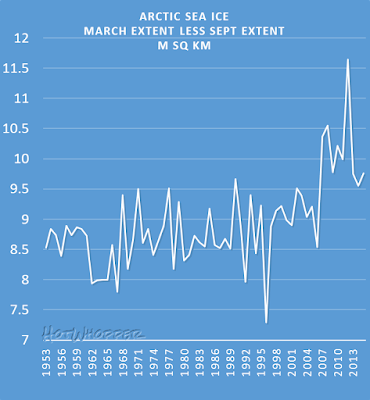 As requested, a chart of the maximum less minimum monthly extent (March minus September for each year). No no no, that's all wrong. It's simply a long series of recoveries. Well that is quite interesting. I visited the journal page but could not find a supplemental data file. Is it some (non-)obvious place I'm missing? The data was sent to me, Brandon. If you would like any other plots, just ask. Eli got me thinking a min/max difference plot would be interesting. And comparing that with seasonal mean differences as well. I wouldn't have ever thought to ask either of you to do additional plots. 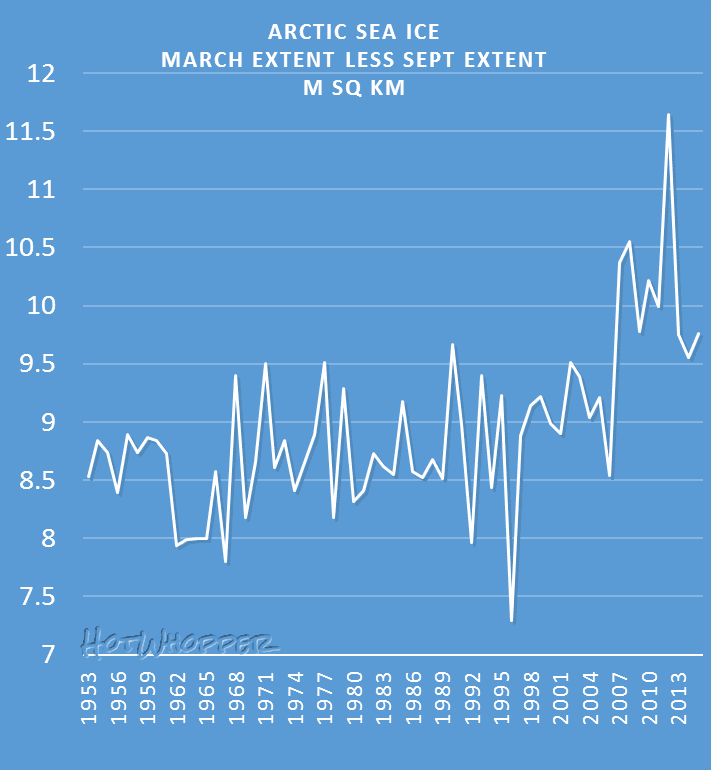 I've added a chart of the maximum less minimum months to the article (March less September each year). 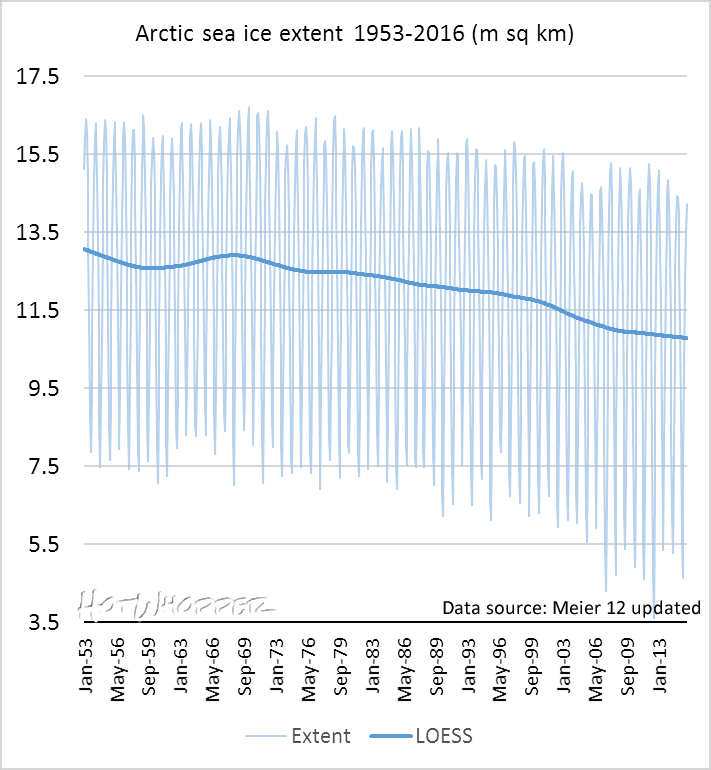 What jumps out at me first is the inflection point around 1998, and that obviously is being driven by an acceleration in the summertime minimum ice extent which isn't so strongly seen in the winter maximum extent trend. Even though there is an expected local spike that year, presumably due to the El Nino, once that episode was done it's like a switch had flipped. Which I think is really interesting, if not a bit disturbing. It's a non-linear response, no? 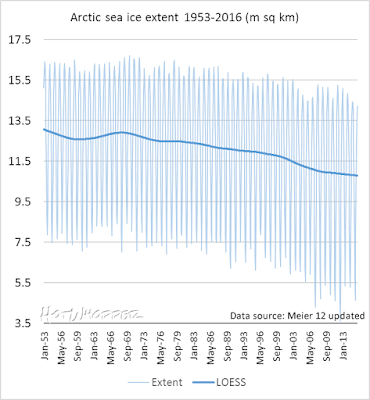 While attribution studies would be necessary to directly link changes in sea ice to climate factors, reaching significance possibly suggests that an external forcing climate signal outside of the natural variability in the ice cover becomes evident in 1989. Doesn't seem to have much else to say about cause. I think it's safe to rule out invisible Leprechauns however. In any case ... Pause? What Pause? 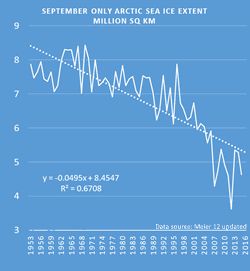 Except for the dratted "uncooperative" Antarctic sea ice extent, once again, I don't see no steenking Pause. I've added a LOESS curve to the annual, February and September charts above now. The help show the changes in the trends over the past 63 years. 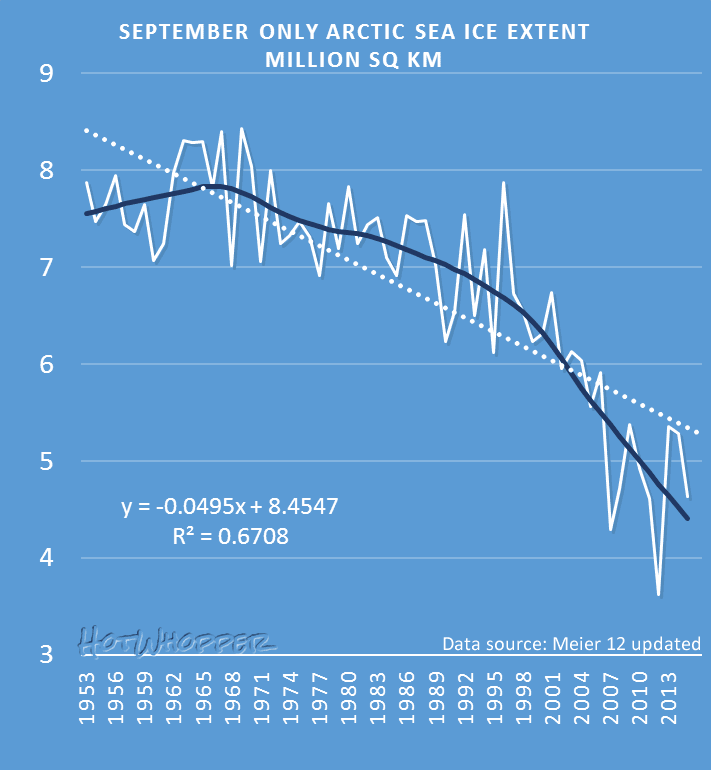 In some strange land of denial(aka WUWT) this is seen as Arctic Sea ice recovery. I expect most of us are hoping that melting will not accelerate from the linear trend line. 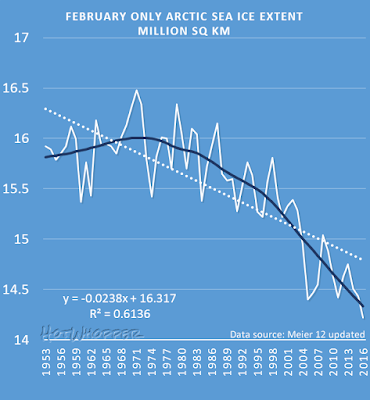 But its nice to see that at WUWT we are now both entering an ice age and coming out of one. You can't have enough ice ages involved. 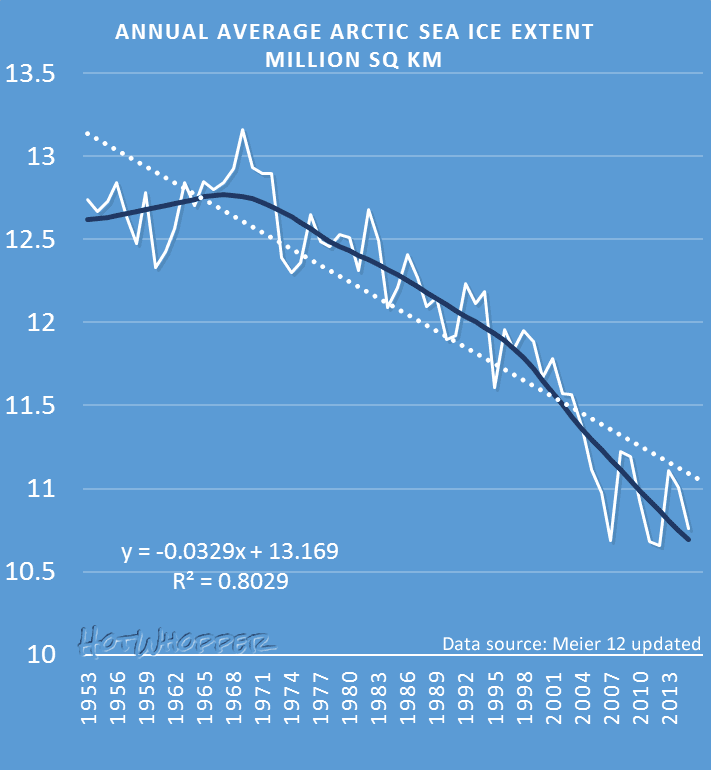 Oh, but if we are recovering from an ice age I guess that the super warm global MWP so beloved of WUWT has to be erased from their collective memories for a day or two. 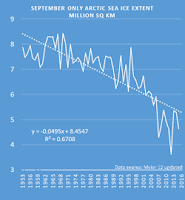 2) Calculate monthly anomalies from the baseline value for that month. What this would do, I think, is make the graph showing all months more useful. 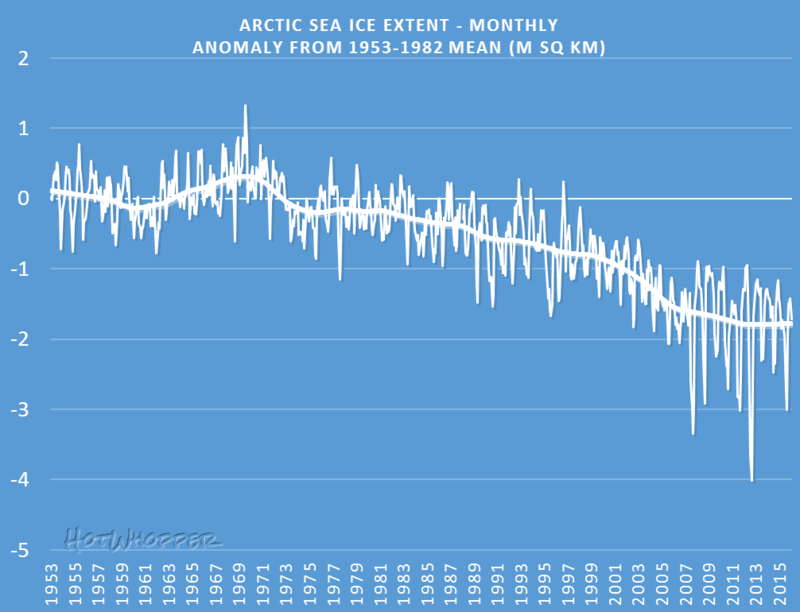 Instead of the enormous light-blue background that's created in the graph, we'd have a better indication of how much the individual months are deviating from what would be an "expected average". DC how about 1953 to 1982 as the baseline (30 years, when there was probably the least change). I can play around with this to see if it's useful. It will take some time, which I won't have for three or four days yet. But I will do it. Thanks, Sou! Yes, a longer baseline makes sense. I've added the chart of difference from the 1953 to 1982 average for each month. Beautiful! That does seem to make the trend more clear and comprehensible. It also seems to stress that recent anomalies that stray far from the current position of the trendline seem to mostly be concentrated in downward spikes, which are farther from the mean than the seem to have been in the past. In other words, not only is the trendline going down, but the deviations from the trend seem to be greater, and downward. Hmmm. Can't seem to embed images in comments here? Greta Thunberg heavily insulted by an Italian newspaper. She's smashing all the mediatic barriers! The Happer files - What a Kangaroo Judge looks like.